The Sud Aviation SE 210 Caravelle was the first short/medium-range jet airliner produced by the French Sud Aviation firm starting in 1955 (when it was still known as SNCASE). The Caravelle was one of the most successful European first generation jetliners, selling throughout Europe and even penetrating the United States market, with an order for 20 from United Airlines. 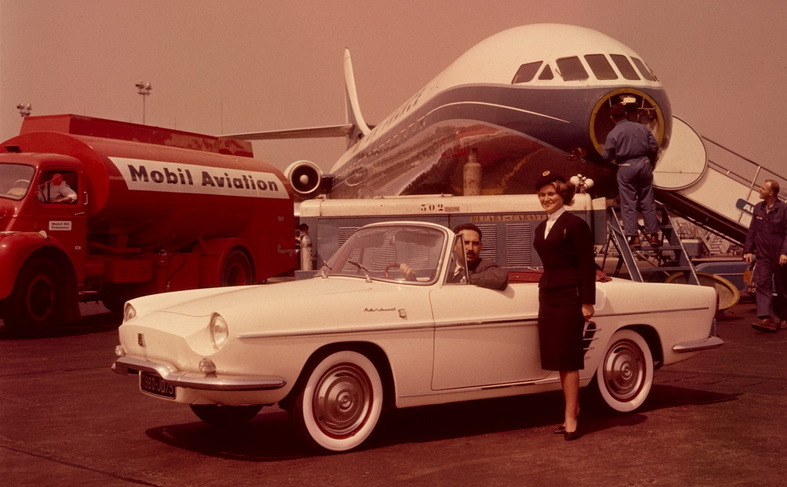 The Caravelle established the aft-mounted-engine, clean-wing design that has since been used on a wide variety of aircraft. On 12 October 1951 the Comité du Matériel Civil (civil aircraft committee) published a specification for a medium range aircraft, which was later sent to the industry by the Direction Technique et Industrielle. This called for an aircraft carrying 55 to 65 passengers and 1,000 kg (2,200 lb) of cargo on routes up to 2,000 km (1,100 nmi; 1,200 mi) with a cruise speed about 600 km/h (320 kn; 370 mph). The type and number of engines was not specified. Various design studies for aircraft in this category had been underway since 1946 by several of the leading French aircraft manufacturing organisations, but none had the financial power to start construction. Response from the French industry was strong, with every major manufacturer sending in at least one proposal, and a total of 20 different designs were received. Most of the proposals used all-turbojet power, although Breguet entered a number of designs for both turbojet and turboprop types; among these was one for an Atar-powered tri-jet to be developed in association with the SNCA du Nord and a turboprop type, all known as Br. 978. Hurel-Dubois entered several turboprop designs based on a narrow fuselage and shoulder mounted wing similar to many regional propliners. Proposals from the SNCA du Sud-Ouest included the S.O.60 with two Rolls-Royce Avon RA.7 engines, with two smaller Turbomeca Marborés as auxiliaries. SNCA du Sud-Est (SNCASE) returned a number of designs from the X-200 to X-210, all of them pure-jet. After studying the various entries, the Comité du Matériel Civil cut the list to three entrants on 28 March 1952: the four-engined Avon/Marbore S.0.60, the twin-Avon Hurel-Dubois project, and the three-Avon Sud-Est X-210. At this point Rolls-Royce started offering a new version of the Avon that could develop 9,000 lbf (40 kN) thrust, making the auxiliary engines on the S.O.60 and the third engine on the X-210 unnecessary. The Committee requested SNCASE re-submit the X-210 as a twin-Avon design. In doing so they decided not to bother moving the remaining engines from their rear-mounted position; most designs mounted the engines under the wing where they can be mounted on the spar for lower overall weight, but SNCASE felt the savings were not worth the effort. This turned out to be a benefit to the design, as the cabin noise was greatly reduced. The revised X-210 design with twin Avons was re-submitted to the SGACC in July 1952. Two months later the SNCASE received official notification that its design had been accepted. On 6 July 1953 the SGACC ordered two prototypes and two static airframes for fatigue testing. Sud's design licensed several fuselage features from de Havilland, a company Sud had dealings with for several earlier designs. The nose area and cockpit layout were both taken directly from the de Havilland Comet, while the rest of the plane was locally designed. A distinctive design feature were the cabin windows in the shape of a curved triangle which were smaller than conventional windows but gave the same field of view downwards. The first prototype of the Caravelle (F-WHHH), christened by Madame de Gaulle, was rolled out on 21 April 1955, and flew on 27 May powered by two British Rolls-Royce RA-26 Mk.522 with 4,536 kgf (44,480 N; 10,000 lbf) of unitary thrust. The crew was composed by Pierre Nadot (first officer), André Moynot (second officer), Jean Avril (mechanic), André Préneron (radio operator) and Roger Beteille. The flight duration was 41 minutes. The second prototype flew a year later on 6 May 1956. The first prototype had a cargo door on the lower left side of the fuselage, but this was removed in the second prototype for an all-seating arrangement. The first order was from Air France in 1956, followed by SAS in 1957. That year Sud-Est merged with Sud-Ouest to become Sud Aviation, but the original SE naming was retained. More orders followed, mainly triggered by presentations on airshows and demonstrations to potential customers. 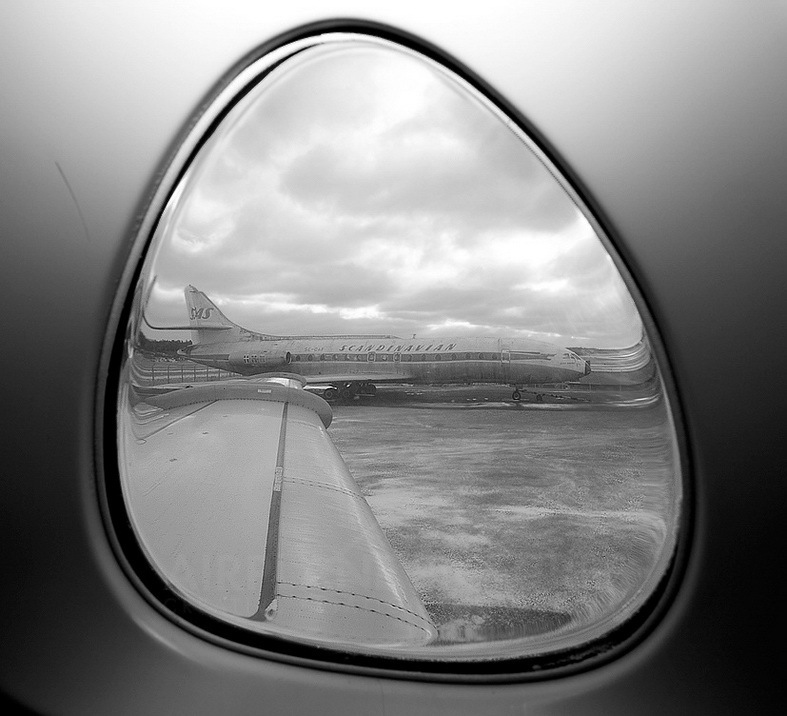 The Caravelle was certified in May 1959 and shortly afterwards entered service with SAS and Air France. Several models were produced over the lifetime of the production run, as the power of the available engines grew and allowed for higher takeoff weights. 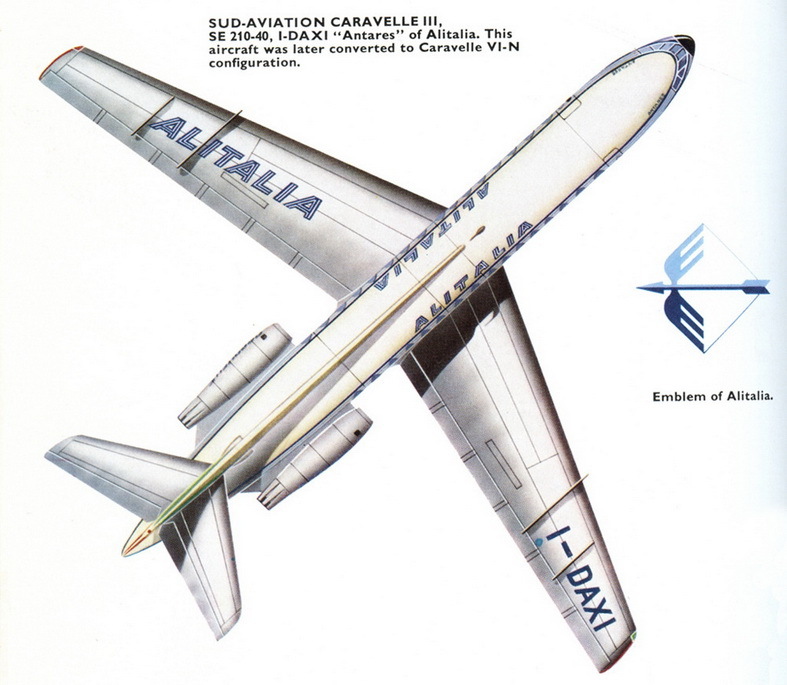 By this time most of Sud Aviation's design department turned to a supersonic transport of the same general size and range as the Caravelle, naturally naming it the Super-Caravelle; however, this work would later be merged with similar work at the Bristol Aeroplane Company to produce the Concorde. In some configurations, aircraft had a number of rearward-facing passenger seats, an uncommon seating arrangement for civil aircraft. In total, 282 Caravelles of all types were built (2 prototype or pre-production aircraft and 280 production aircraft), with Sud Aviation's break-even point at around the 200 mark. 19 January 1960 - SAS, SE-210 Caravelle, OY-KRB, crashed at Esenboga Airport, Turkey. Seven crew members and 35 passengers lost their lives. 1963: Swissair Flight 306, crashed shortly after take-off from Zürich, killing all 80 people on board. 30 June 1967 - A Thai Airways International SE-210 Caravelle III crashed into the sea while landing at Hong Kong's Kai Tak Airport during a typhoon. The co-pilot, who was flying the aircraft, allegedly made an abrupt heading change, causing the aircraft to enter into a high rate of descent and a crash into the sea short of the runway. 24 were killed. 4 November 1967 - Iberia Airlines Flight 062 crashed at Black Down Hill Sussex, United Kingdom killing all 37 passengers and crew. 1968: Air France Flight 1611 was a Sud Aviation SE-210 Caravelle III en route from the island of Corsica to Nice, France on September 11, 1968 when it crashed into the Mediterranean Sea off Nice, killing all 95 on board. According to the official report, the crash was non-survivable. 26 July 1969 - Air Algérie, 7T-VAK crashed at Biskra, Algeria killing 33 passengers and crew out of 35. The aircraft crashed onto the runway while attempting an emergency landing due to an in-flight fire. 20 November 1971 - China Airlines, B-1852 crashed near Penghu, Taiwan killing all 25 passengers and crew. Possible bomb attack but the real cause is still unknown. 7 January 1972- Iberia Airlines Flight 602 crashed into a mountain while on approach to Ibiza Airport in Spain. All 104 passengers and crew were killed. 14 March 1972 - Sterling Airways Flight 296 crashed in the United Arab Emirates killing all 112 passengers and crew. 1 June 1973 - a Cruzeiro do Sul Sud Aviation SE-210 Caravelle VIN registration PP-PDX flying from Belém-Val de Cães to São Luís crashed on approach to São Luís. Engine no.1 lost power and the aircraft attained an extreme nose-up attitude. It stalled and crashed 760m to the right of the runway. All 23 passengers and crew died. 13 August 1973 - Aviaco Flight 118, crashed near A Coruña, Spain killing all 85 passengers and crew, while attempting to land at Alvedro Airport (now A Coruña Airport) in heavy fog. 11 September 1973 - JAT Airways Flight 769 crashed while on approach to Titograd Airport. All 41 passengers and crew died in the accident. 12 October 1976: Indian Airlines Flight 171, Bombay, India: The right engine caught fire shortly after takeoff and the crew elected to return. Fuel flow to the engine was not stopped and the fire spread through the fuselage and led to hydraulic system failure and a loss of aircraft control shortly before landing. All six crew members and 89 passengers were killed. 18 December 1977 – SA de Transport Aérien Flight 730 crashed into the sea while on final approach to Madeira Airport, killing 36 people. 18 January 1986 - An Aerovias Caravelle temporarily leased from Ecuador's SAETA, reg. HC-BAE, crashed in the jungle after two missed approaches, killing all 87 occupants. The flight originated in Guatemala City and was to land at Mundo Maya International Airport in the northern department of Petén.